After decades of intense observation and campaigning by conservation groups, awareness of microplastic pollution has fortunately grown. There is now worldwide concern about tiny pieces of plastic litter that are having a harmful impact on marine species and habitats. Large plastic litter has already been identified as both an eyesore and a danger to turtles, seabirds and marine mammals. So the scene was already set for mass action against microbeads and other forms of tiny plastics, which are present in things such as shower gels and beauty products. But most of the small plastic we find doesn’t come from your face wash. It is formed from the breakdown of larger plastics such as bottles and bags. Less widely known as a source of microplastic is the breakdown of synthetic fabrics, which forms tiny plastic fibres. Reports now indicate that these are the most common form of microplastic recovered from sediment and water samples. And the vast majority of these are produced during domestic clothes washing. In the washing machine, abrasion of clothes removes tiny fibres which are too small to be caught by the machine’s filters. This may add up to hundreds of thousands of fibres from a single wash. 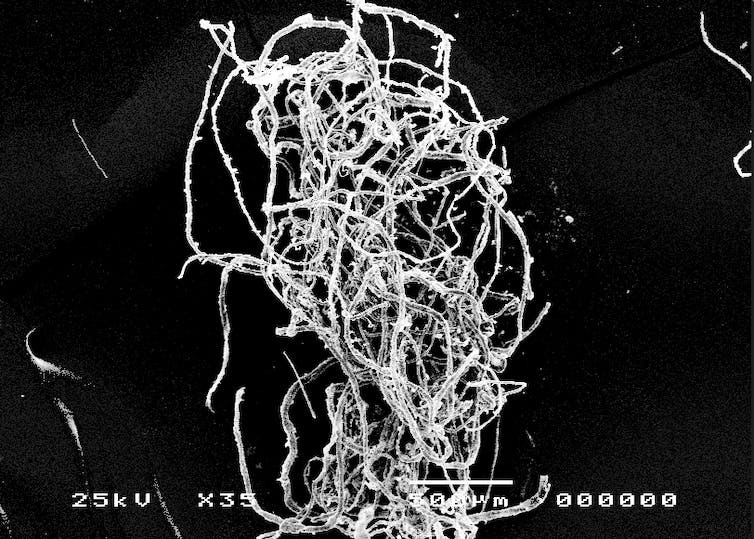 These fibres are then carried in the waste water into the sewage system, but are far too small to be removed in the treatment plants where other solid materials and pollutants are caught. As a result, the fibres escape into rivers and then oceans. The fibres which end up in the ocean come from every kind of synthetic garment – from your socks and swimsuits to pullovers and parkas. Plastics break down very slowly in the marine environment, so the amount of fibres in the ocean increases year on year. And they do not stay still. Many plastics are buoyant, enabling them to float for thousands of miles and affect a wide variety of animals on their travels. As microplastics are so small, they are just the right size to be eaten by a range of marine species. Fish, crabs, lobsters, mussels, sea cucumbers and many other creatures are known to have ingested them. And while not all animals will be negatively affected, plastic ingestion has been seen to increase the number of deaths. Other animals have been observed feeding less, having lower fat reserves, and producing fewer offspring. Some of the species that eat plastic may end up on your own plate. We remove the stomach of most fish species, but invertebrates such as mussels are consumed whole (minus the shell). While there is currently no evidence of negative health effects linked with microplastic transfer from seafood, the fibres are definitely there, and the impact of plastic ingestion may affect the efficiency of fisheries and the nutritional value of our food. As the world population grows, greater numbers of synthetic fibres will be produced and washed. The annual releases of plastic fibres will increase, and so will their impact on the environment. Animals which previously contained only a few fibres will be exposed to many many more, and those that suffered increased mortality or other negative impacts will be more dangerously affected. Awareness of the dangers of microbeads and plastic bags has resulted in a reduction in their use by consumers, and actions to produce environmentally sensitive alternatives by manufacturers. We can reduce the amount of fibres released from our homes by thinking about the way we wash. Ensuring washing machines are at full capacity to reduce the tumbling to which our clothes are exposed is a start. Choosing to wear and wash natural fibres will reduce the number of synthetic fibres from which fragments can be made. It is also possible to catch some of the fibres before they escape the machine. New products include the Guppyfriend – a laundry bag designed to catch fibres before they reach the drain – and the Cora Ball, which mimics the action of filtering corals. 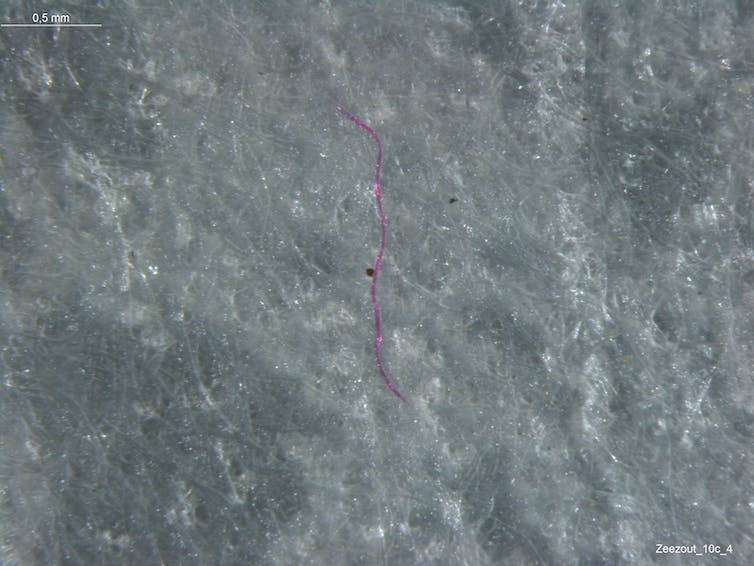 However, the issue of what to do with the recovered fibres remains. In the short term, reducing the amount of microfibers we produce will help to lessen the impact on our oceans. But it will not be enough to stem the effects of population growth. Manufacturers need to address the rate at which fibres are shed from our garments and other fabrics. For our marine life, plastic means permanent pollution. As consumers we need to understand the environmental impact of fast fashion and short-term clothing. The trouble is, it really does all come out in the wash.